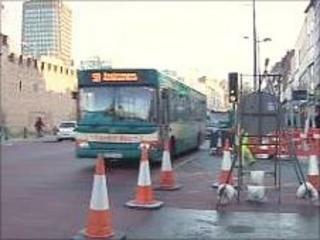 A two-year £34m project to tempt drivers in Cardiff to switch to sustainable transport is in danger of failing, says an environmental charity. Sustrans Cymru warned that Wales' first Sustainable Travel Centre project had not learned from English pilot schemes. It told BBC Radio Wales more should be spent on educating people to change their travel habits. Cardiff council conceded its initial approach had been "bitty" but said it was now planning more strategically. The Eye On Wales programme found Sustainable Travel Town projects have had some success in England in getting more people to take the bus or cycle or walk. Cities such as Worcester saw a reduction in car use of around 9% by launching multiple initiatives targeting those trips of three miles or less that make up half of all journeys. The English schemes promoted alternatives that were better for the environment and for people's health. But there are concerns that if Wales' first Sustainable Travel Centre (STC) in Cardiff fails, the knock-on effect may prevent the nation from hitting ambitious targets to reduce carbon emissions. Lee Waters, Sustrans Cymru's national director, said that since the scheme was launched in 2009 Cardiff council's focus has been on infrastructure projects. He said he was concerned that spending on promotion and education had been a secondary priority. "If we show people that in a town it is often quicker to get door-to-door by bike rather than car, they will do it," said Mr Waters. "If you make it difficult for people they won't do it. "The challenge for this project is how do we make it simple, easy and convenient for people to travel in ways which benefit their health and the environment? If we do that, we'll crack it. "If we don't, and we waste a lot of money on expensive infrastructure projects which don't address that behavioural problem, then we're going to fail." Eye on Wales found that Cardiff's sustainable transport plans were not tested by the rigorous bidding process that preceded similar initiatives in England. Instead the city was given extra funding to implement projects already in the pipeline. Delme Bowen, who holds the transport portfolio at county hall, accepted that this may have blurred the city's initial focus. "A lot of these plans were in the offing, they weren't strategically tailored, I would say that," said Mr Bowen. "The cycling plan that we did have was a bit bitty and 'Let's do what we can'. "Now we are looking at it in a strategic way - we've just made a new appointment on the cycling side to assist in that - so I think we are looking at it differently." Cardiff's STC is 50% funded by the Welsh Assembly Government, which sees sustainable travel as key to achieving the ambitious target it has set itself of cutting transport carbon emissions by 3% by 2011.